The federal qualification for commercial truck drivers are set forth at 49 C.F.R. § 391. The rules in this part specify minimum duties of motor carriers with respect to the required qualifications of their employee/drivers. 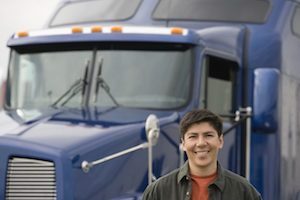 In order to be qualified to drive a commercial motor vehicle, a driver must meet the following minimum requirements and responsibilities: They must be at least twenty-one (21) years of age and speak and read English well enough to converse with the general public and understand highway signals; they must be able to drive the vehicle safely and be in good health and physically able to perform all duties of a driver; they must possess a valid medical certificate and have only one valid commercial motor vehicle operator’s license. They must also provide an employer/motor carrier with a list of all motor vehicle violations or a signed statement that they have not been convicted of any motor vehicle violation during the past twelve (12) months. Obviously, they must be qualified to drive a commercial motor vehicle, pass a driver’s road test or its equivalent and know how to safely load and secure cargo. A trucking company must not allow any employee to drive a commercial vehicle unless he or she has completed and signed an application for employment. The motor carrier must have the driver’s driving record for the preceding three (3) years and must not allow such a person to drive a commercial motor vehicle until he or she has successfully completed a road test and has been issued a certificate or a copy of the license or certificate which the motor carrier has accepted as being equivalent to the driver’s road test. A motor carrier must request the driving record annually for each of its drivers and must carefully review and certify annually that all of its drivers meet the minimum requirements for safe driving and have no “disqualifying offenses” enumerated in the Code of Federal Regulations. Obviously, the motor carrier must make sure that there is a proper medical examiner’s certificate in the file which the driver has passed certifying the ability to perform driver duties. In addition, as set forth in earlier blogs, an investigation of the driver’s employment record for the preceding three (3) years must have occurred. The trucking company must also obtain an accident history for three years with an alcohol and controlled substance testing records for three (3) years. These minimum qualifications must be observed by the trucking company/employer. If not, the company can be sued for negligent hiring and negligent entrustment.